With all of the concerns about flashy graphics, frame rates, intense plot lines and the like, sometimes we gamers forget that a game really needs to only do one thing to be considered a success. It needs to be fun. Sega put that theory to the test when, in 2001, it released Super Monkey Ball for the Nintendo Gamecube. 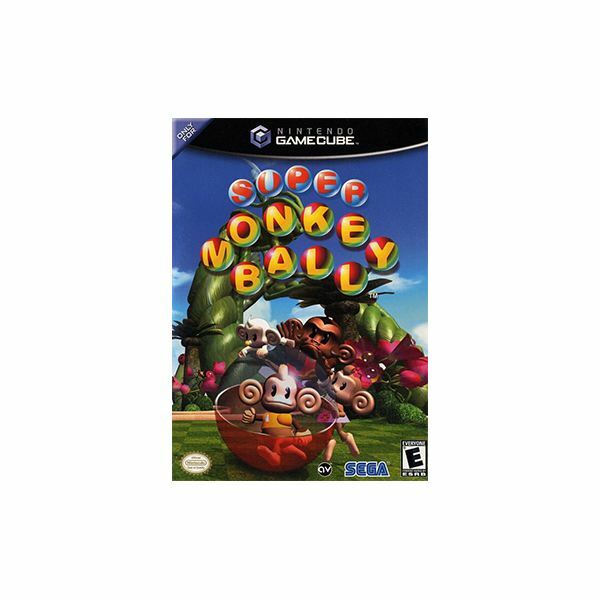 Developed by Amusement Vision and based off of an arcade title, Super Monkey Ball is a game that wholeheartedly subscribes to the "less is more" approach, and in doing so emerged as one of the top pick-up-and-play titles of the pre-Nintendo Wii era. The concept of Super Monkey Ball is exceedingly simple. You play as a monkey rolling around in what looks to be a giant hamster wheel. In each level, there is a puzzle course laid out before you, and using the analog stick, you need to roll your monkey from start to finish, collecting bananas along the way. The faster you get there and the more bananas you collect along the way, the more points you will be awarded. Fall off of the course or fail to reach the goal in the established time limit, and you lose a life, which can be replenished by collecting 100 bananas throughout the course of the game. A game with a simple concept like this lives or dies on its control scheme. Thankfully, the controls are tight and responsive, though some of the more challenging levels require the precision of a surgeon to complete. Clearly, the game is very user-friendly, even for non-traditional gamers or those who haven’t touched a game controller since the days of the Atari 2600 joystick. With multiple difficulty levels and even some neat minigames for up to four players, Super Monkey Ball winds up being a rousing success in the gameplay department. Pleasant is probably the best way to describe the audio and visual presentation of Super Monkey Ball. There are four monkey characters to choose from (AiAi, MeeMee, Baby and Gongon), and each of them are rendered in a reserved-cutesy style that will be appealing to the kids, but isn’t necessarily going to make anyone over the age of 18 want to vomit, if you know what I mean. They’re charming to look at but not too sugary-sweet. The courses are well designed and easy to see, while the upbeat music fits well and will probably even make you bob your head to the beat every once in a while. Also, in a nice touch, there’s an announcer who, in a loud and clear voice, lets you know which level you’re on, when to start and even when you’ve fallen out. It lends to the arcade feel of the game. Overall, while this isn’t a flashy game by any stretch of the imagination, everything is crisp, clean and technically sound. You’ve probably noticed that this review is shorter than your average Bright Hub review, and there’s a good reason for that. It’s because there’s just not a lot to talk about with Super Monkey Ball. The game’s minimalist approach to things means that there’s no epic plotline to discuss, no complicated controls to go over, none of these other elements that many games have come to rely upon. Ultimately, though, that’s the beauty of this title. It’s simple pick-up-and-play fun, challenging at times but never unfair, and it works. The game was popular enough to earn Player’s Choice status from Nintendo and spawn several sequels and ports, many of which took the basic concept, added fancier control schemes and more detailed stories, and absolutely ruined it. If you want to see Super Monkey Ball in its heyday, make sure you check out the original, especially since it can be played on the Nintendo Wii with a Gamecube controller.